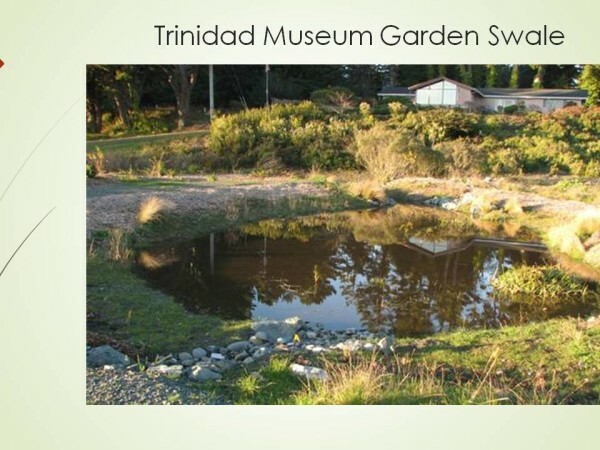 The Trinidad Museum Garden is a project of the TMS Landscape Committee under the original supervision of our landscape designer, Nancy Rehg. Many volunteers, contributors, and sister organizations have helped us achieve a great beginning. 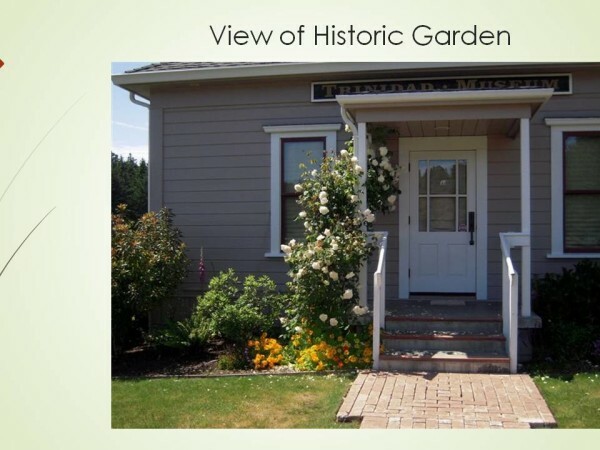 The garden is a living component of the museum, with an educational, historical, and scientific mission. 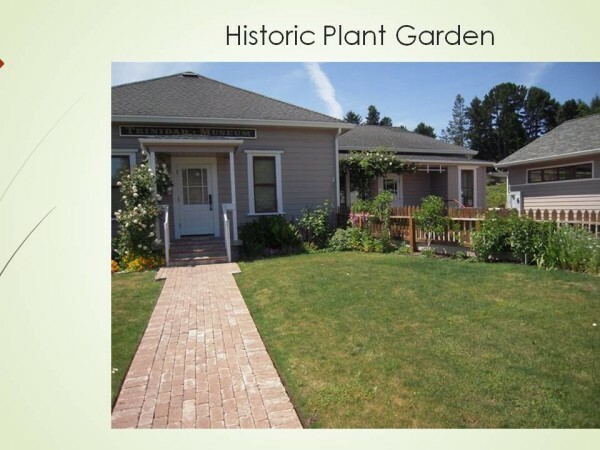 The garden has two parts: a native plant garden and a historical garden. 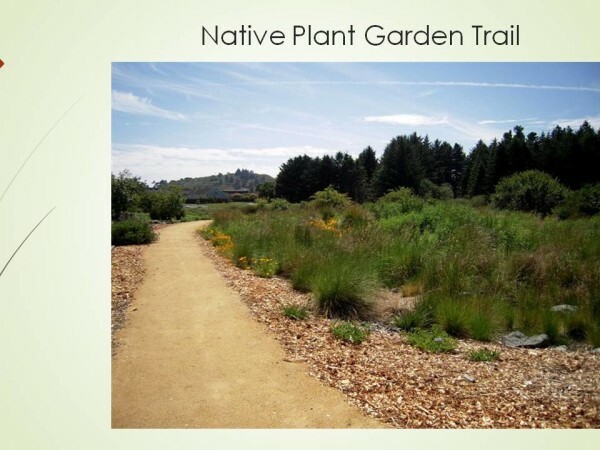 The primary part is a native plant garden. 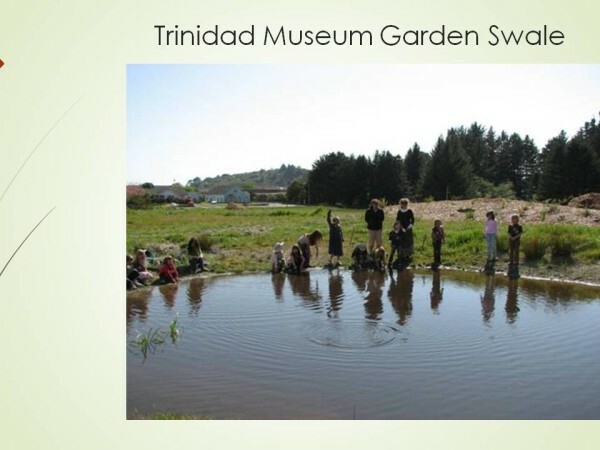 It has a two-fold purpose: to introduce people to the common native plants in the Trinidad area, especially those growing on the Head and in the state parks, and to inspire people to garden with local natives. Several habitats are represented in the garden: woodland, open sunny areas, which simulate the conditions on Trinidad Head, coastal meadow, like the open areas on Elk Head, and wetland. We were unable to reconstruct “miniforests” of alders and conifers because those trees get too large. 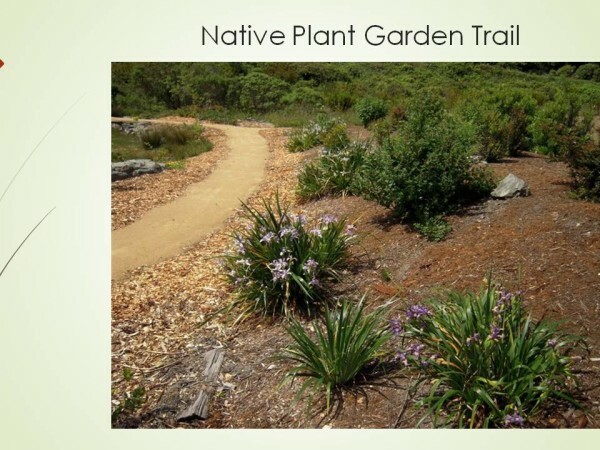 The native plant garden is the larger of the two and at present the more dramatic of our gardening achievements. It consists of the upper garden north and west of the Sangster-Underwood house with a swale, berms, and a variety of native plants from the Trinidad area. The banks and lower garden also display native plants, some of which were already growing there. 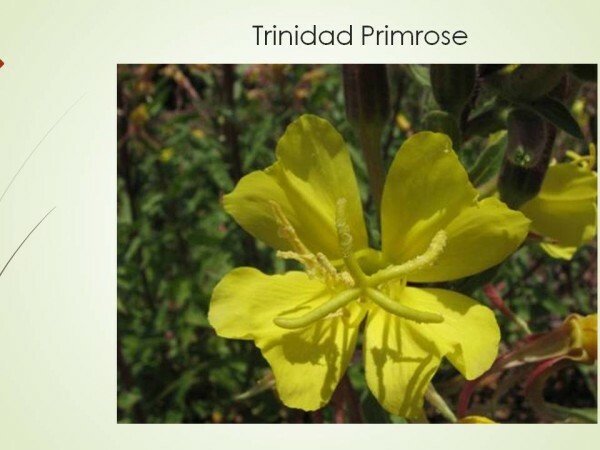 These Trinidad natives will require less care, water, and soil amendments than non-native plants. Already our native plants are bringing in birds, frogs, insects, butterflies, and other native creatures while offering great beauty. 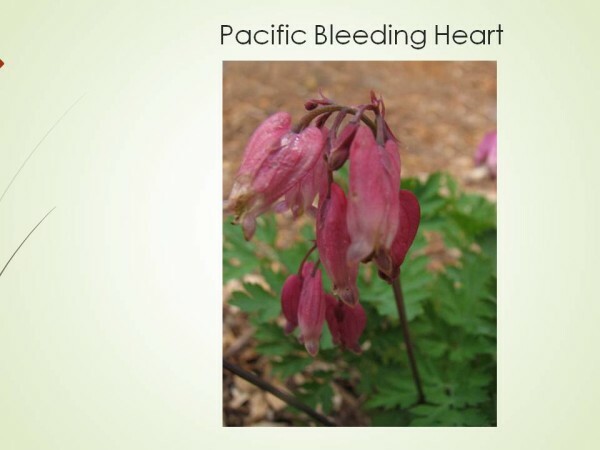 Some of these plant species are also used by Native Americans and relate to local Yurok traditions. 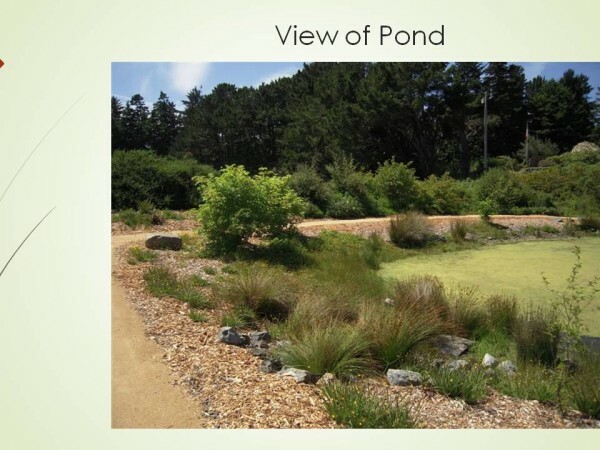 An additional benefit of the native plant garden is that it demonstrates how an environmentally friendly garden can be created on a land fill site. 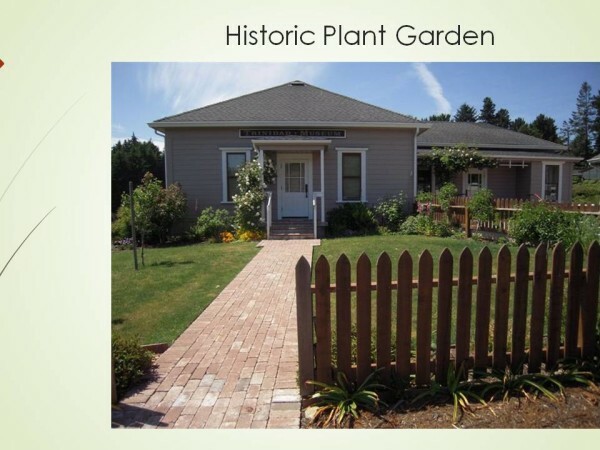 The second part is a historical garden, which is in front of the Sangster-Underwood house within the picket fence. This garden features ornamentals of the early 1900s and some of the favorite plants of Martha Underwood. 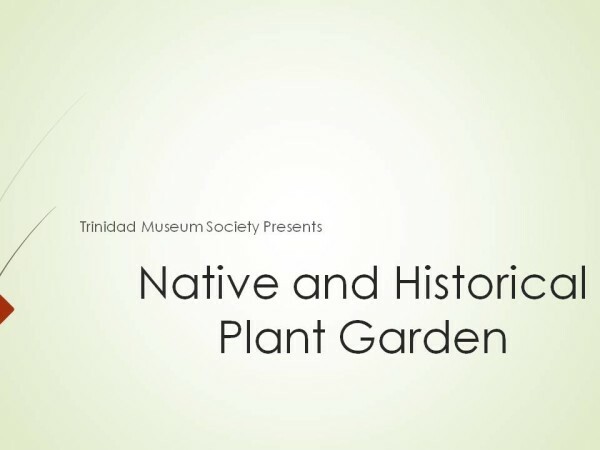 It provides an attractive approach to the museum and give a historical sense of early gardens in Trinidad. 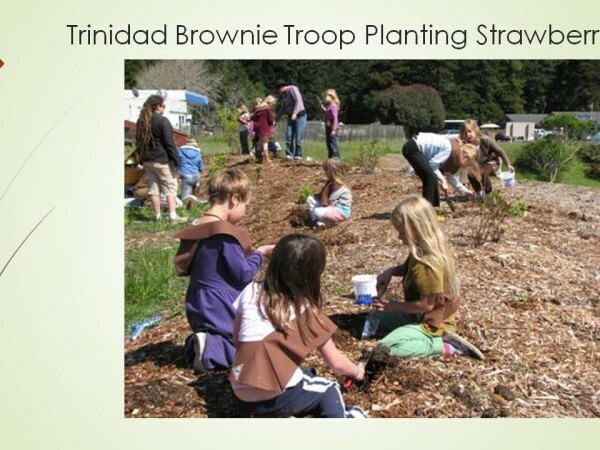 The garden was planted on landfill from construction of the freeway south of Trinidad. It consists largely of “blue goo” clay and therefore drains very poorly but has an abundance of minerals. There was practically no topsoil — only the thin layer which developed on the surface through the decades before the museum was moved here. We haven’t been able to add much topsoil (difficult to find, and expensive to buy). Most of the organic material we have added consists of wood chips, along with some partly decomposed leaves and needles. We are very thankful for the great support of the membership, community, and wonderful volunteers. Enjoy a few photos of the native plant garden! The garden is a work in progress and ever changing as some plants survive and grow and we add new ones. Keep checking it out and watch it develop! This list includes only plants along the paths, but other species are planted on and at the bases of the south and west slopes and at the back of the west mound. These are along the more shady sides of the museum. They are listed in order as you walk along the path to the right of the museum, turn left, and walk along the museum toward the west(Ferns, herbs, and woody plants are listed separately). Dies back in winter. Leaves widest near the center (oval in outline), very common in moist fairly shaded places, such as along the trail to Elk Head. Evergreen. Leaves widest at the base (triangular in outline), not as common as the lady fern, but in similar habitats, often on rotting logs and stumps. Evergreen. Has two kinds of narrow leaves: general vegetative leaves and specialized long vertical leaves which produce the spores, common in partly shady more or less disturbed areas, such as along trails and on banks. Evergreen. With larger and wider leaves than the deer fern, our most common fern, occurring both in sunny locations such as Trinidad Head and in deep shade in forests, often forming dense patches in redwood forests. Dies back in winter. Leaves finely divided with the main branches radiating out in curving arc from smooth blackish thin stalks, occurring on moist shady banks, such as near the base of the road up Trinidad Head, and is the predominant fern in Fern Canyon in Prairie Creek State Park. Stalks used in basketry by the Yurok and others. Small star-shaped white flowers with pink lines and smooth, delicate leaves, common under alders (Elk Head, Rim Trail at Patrick’s Point State Park). With yellow, funnel-shaped flowers flaring outward at the end, and toothed leaves, likes moist areas (seeps, along creeks). Dies back in winter. Has yellow flowers and relatively large smooth, thin, delicate leaves, commonly occurs in fairly damp places, often with candy flowers. Evergreen. 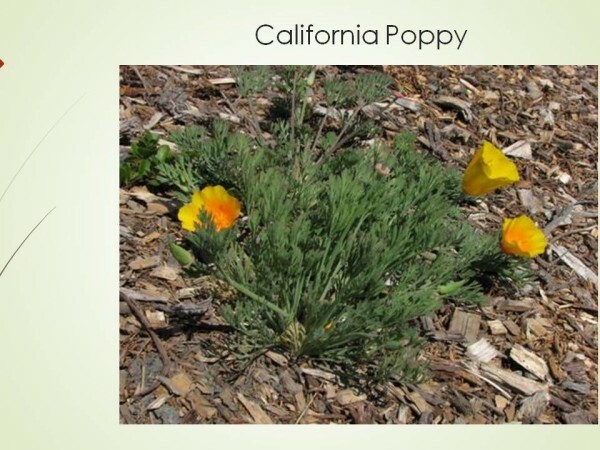 With yellow flowers and relatively small, fairly round, thick leaves, can tolerate fairly dry conditions, common in redwood forests and on shady, but dry soil such as on road cuts. Has multiple small white flowers with petals which flare upward and outward, so that the flowers resemble tiny parachutes, more sporadic in occurrence than the plants so far, but can be seen in Trinidad Beach State Park and Patrick’s Point State Park. 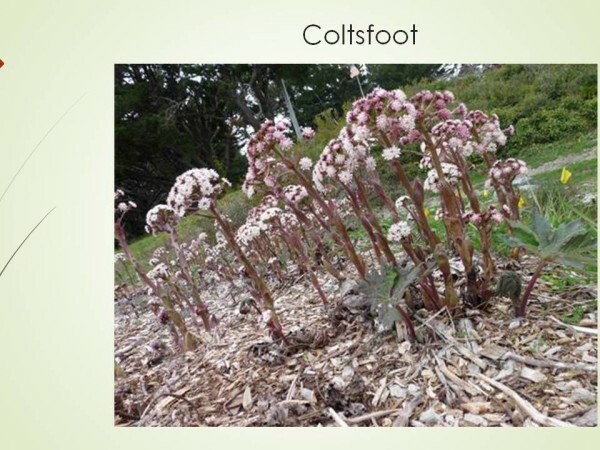 Can be recognized by its three-lobed, clover-like leaves with reddish undersides, and its conical white flowers with pink lines, probably the most abundant plant under redwoods, but not restricted to redwood forests, forms extensive carpets on the ground and on rotting logs and stumps, well adapted to climb on and over obstacles. Can be recognized by its large, heart-shaped, thickish leaves with a strong ginger-like odor, and large but inconspicuous dark maroon flowers with very long, thin, tapered petal tips, sporadic in distribution, but widespread in our area, a good place to see it is alongside the beginning of the road up Trinidad Head, on the left. 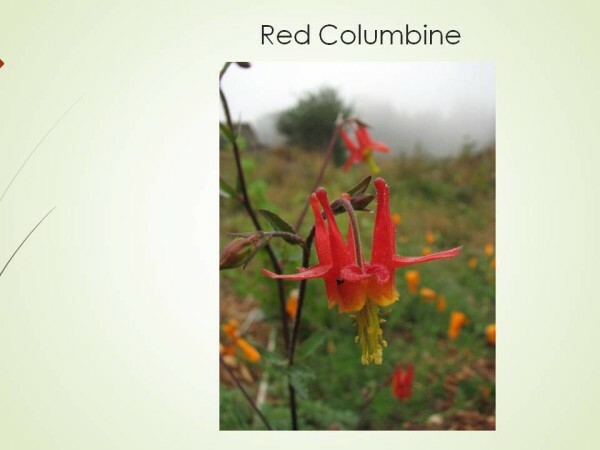 Erect plant with divided leaves and distinctive bright red flowers with upward-pointing spurs with nectar-filled rounded tips attractive to hummingbirds, the spurs resemble the head of a dove and the spreading petals suggest wings, hence its common name (the Latin name for dove is “columba”). With numerous small tubular reddish flowers on a tall stem, and hairy leaves with pointed lobes, often reproduces asexually by small plantlets which develop on the leaves, very common on moist ground, sometimes covering large areas, particularly abundant along streams, often grown as a container plant. (behind the bench in back of the museum) It is called “slink-pod” because the stems bearing the developing fruits curve among the leaves of the plant and along the ground. Its flowers are inconspicuous and have three sepals with many dark lines on a whitish background and three very narrow upright petals. The large paired leaves have parallel grooves and have dark-spots. Slink-pods are sporadic in moist forests, some occur along the trail down to Trinidad State Beach. An erect plant with alternate horizontal leaves and tubular white flowers which flare slightly at the tips and hang from the underside of the stems, and produces orange fleshy fruits in late summer which are large and conspicuous, common in alder forests, such as along the trail to Elk Head. Produces a cloud of small, star-like, white flowers above the rounded, lobed leaves, occurs in moist, fairly sunny locations. This lovely plant has pink, heart-shaped flowers hanging from the curving stalk and large delicate, highly dissected, fern-like leaves. 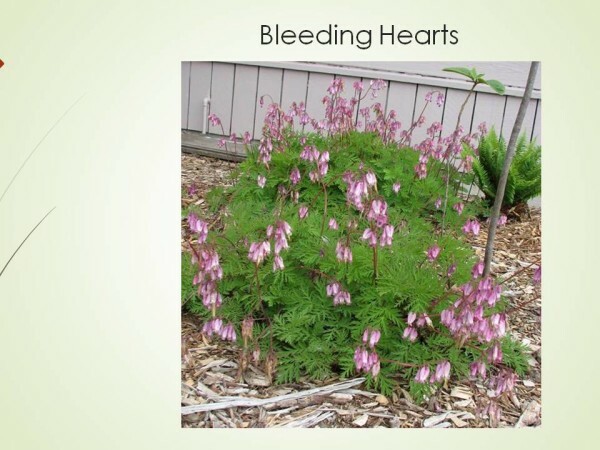 Bleeding hearts can cover extensive areas in alder forests. They occur along the trail between Trinidad and the Elk Head parking lot on the portion which loops toward the west. This plant can be used as a beautiful ground-cover in a partly shady area in a home garden, along with Oxalis, fairy bells, and the violets. Mayflowers have a stem with a cylindrical cluster of tiny white flowers above heart-shaped leaves, and has conspicuous, bright red, translucent berries in late summer-fall (inedible). They are very common under conifers, particularly spruces, covering extensive areas. A particularly striking population of May flowers occurs in the campground at Dry Lagoon. Trilliums have three large oval leaves with a pointed tip and a single large three-petaled flower, which in this species is white at first, but turns a deep rose-red as it ages. It is mostly a forest plant and is fairly common locally. However, a group of several plants occurs along both sides of the trail up Trinidad Head between the two spur trails off the western portion of the trail (an unusual habitat for this Trillium). Do not pick trilliums, as that can kill or weaken the plant and prevent it from reproducing. The plants only produce one set of leaves and a single flower in a season from the previous season’s stored food, and needs its leaves to produce the next year’s leaves and flower. (on the mound with the cascaras) A delicate, grass-like plant which is very common in alder forests, such as along the trail to Elk Head. (shrub) Deciduous. This species has angled branches, small oval leaves, small, pinkish, urn-shaped flowers, and round translucent edible berries, which are an important pre-winter food for birds and mammals. It is a common understory shrub in conifer or mixed forests, often on rotting logs and stumps. (shrub) Evergreen. This huckleberry has small, pointed, toothed, shiny, dark green leaves, pinkish-white, urn-shaped flowers which are larger than in red huckleberries, and numerous round, black edible berries. The berries are an even more important pre-winter food for birds and wildlife because of their abundance. This species is much more common and widespread locally than the red one. It occurs both in forests and in open sunny locations, such as on Trinidad Head, where it is a prominent component of the coastal shrub community so well displayed on the Head. It makes an excellent hedge plant, since the plants are dense and evergreen, respond well to pruning, have pretty pink flowers, and produce abundant berries. (small tree) (near the NE corner of the museum) Deciduous. The leaves are opposite, have 7-9 lobes, and turn red in the fall. The white flowers are small, but striking with their deep red sepals, and are attractive to pollinators. The fruits have two wide-spread wings and are distributed by wind. The trees grow in damp open areas in forests as an understory tree, or at the edges of forests. They are not very common in the Trinidad area, but common in Prairie Creek State Park. We highly recommend it as a very decorative small tree for the home garden. (medium-sized tree) Deciduous. This tree has an open branching pattern with the branches tending to curve outward and upward. It has gray bark, which in the past was made into a laxative. 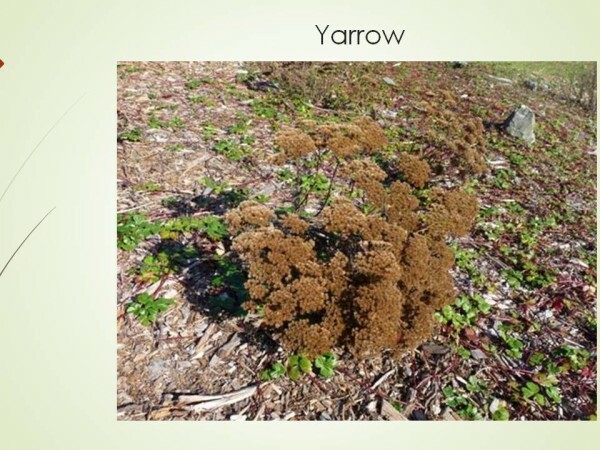 Its leaves are large and oval, and they turn a beautiful yellow in the fall. This tree is important ecologically: its clustered flowers secrete nectar, important for pollinators; its black berries are an important fall food of migratory birds, such as band-tailed pigeons and robins, which spread the seeds far and wide, and it has bacteria in its root nodules which fix nitrogen. Cascaras are very common and can form dense thickets in open sunny locations. Continue following the path counterclockwise around the garden back to the starting point. The plants are listed in the order you will encounter them on the left side of the path. Perennial. This is one of our biggest and showiest coastal plants, with its large spike of blue and white pea-like flowers attractive to bees. The pods are hairy and produce abundant seeds. The plants are fairly common in open sunny, often disturbed locations, such as roadsides and coastal bluffs. This is a more or less prostrate plant, and has opposite leaves and small blue flowers. It is very widespread and common in wet sunny areas, often at the edges of ponds and even floating in the water. It is an indicator of wet, poorly drained ground (such as here). (the ground-cover on the mound) It can be distinguished from other native species of strawberries by its shiny, dark green leaves. The plants spread by runners and can cover large areas. They are common on dunes and beaches and in coastal grasslands. This species is one of the parents of the commercial strawberry (the berries are very small but flavorful). 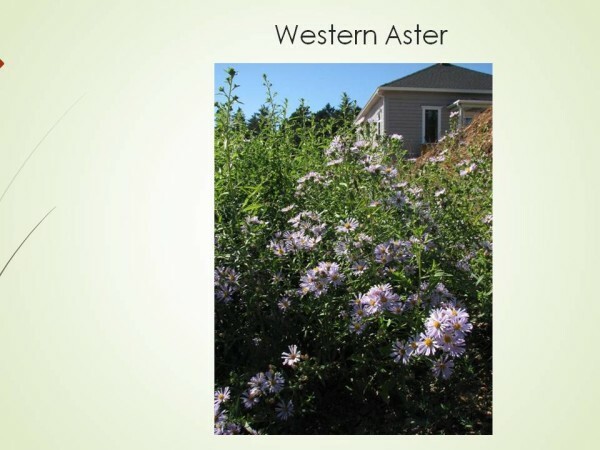 It can be used as a ground-cover in sunny locations in gardens, but can get out of control. Members of this genus usually have very reduced, inconspicuous leaves at the base and generally occur as clusters of stems which are round in cross-section and produce clusters of small flowers. They occur in wet areas and are indicators of wetlands or poorly drained soil. (small tree) Evergreen. Silk tassels have opposite elliptical leaves with wavy margins. Each plant has either male or female flowers. The male plants produce very striking long gray catkins in winter, which persist for a long time, and they are widely grown locally as ornamentals, including along the highway. It is a dominant member of the coastal shrub community, as on Trinidad Head. Deciduous. This member of the rose family has multiple long more or less erect woody branches with brown shredding bark, lobed and toothed leaves, and whitish flowers in rounded clusters. It occurs in fairly sunny wet areas such as along streams. This is a small herbaceous composite with thick stems and somewhat thick oval leaves, and pinkish-purple ray flowers surrounding the yellow disk flowers. 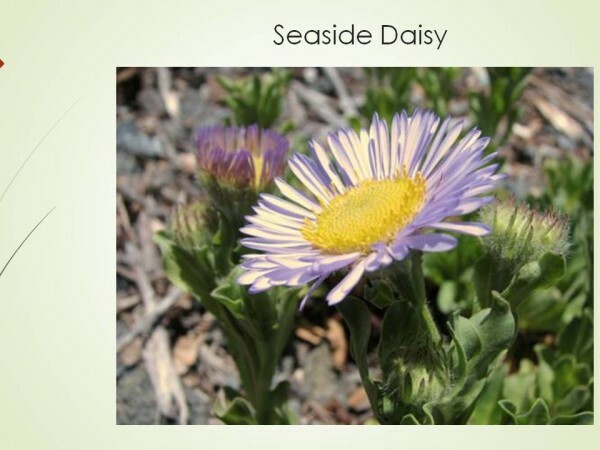 It grows on coastal bluffs and sand dunes such as at Trinidad State Beach. It makes a colorful addition to rock gardens. The state flower. 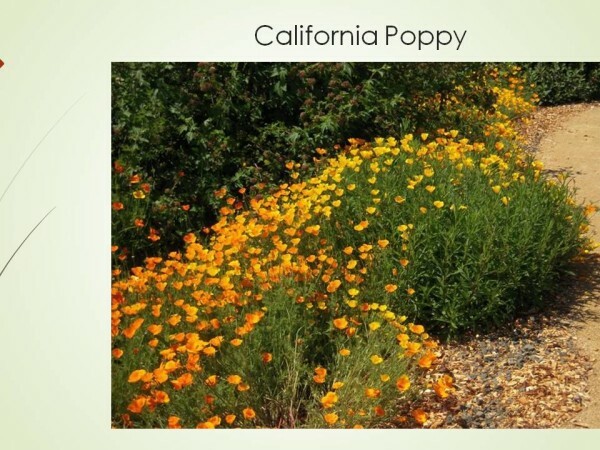 The poppies in our garden were grown from seed collected from a wild population growing along the Mad River in Blue Lake, where the plants have flowers ranging in color from the typical deep orange to yellow. 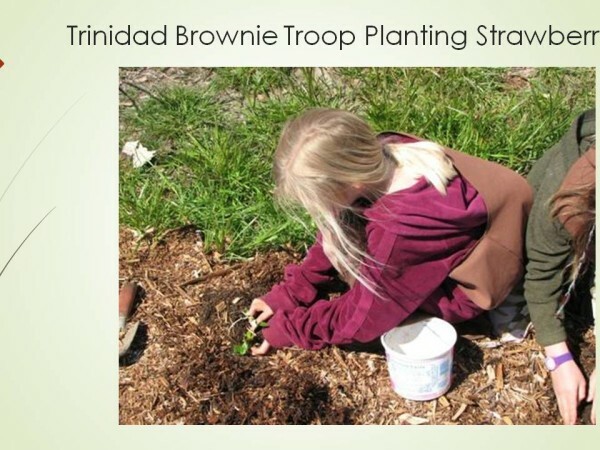 It is unlikely that poppies grew in the Trinidad area before people cleared the land and brought them in as garden plants, since they need open sunny areas without competitors. However, they may have grown on the edge and faces of the bluffs where there is much ground disturbance or on rocks outcrops. The large bright orange poppies now in the Trinidad area are garden escapes. (small tree) Evergreen. This tree has small oval leaves which are dark green and shiny on top and have three prominent veins. The tiny flowers range from pale to deep sky-blue and occur in small dense rounded clusters. Blueblossums occur in open sunny locations and make a striking spring-time display on Trinidad Head. These plants have nitrogen-fixing bacteria on their roots and the flowers attract bumblebees and other insects. Deciduous. Thimbleberries have erect woody, spineless stems, soft finely fuzzy maple-like toothed leaves, and several conspicuous white, star-like flowers in terminal clusters. The red thimble-shaped berries ripen at the end of summer and are important to wildlife and also are eaten by people. 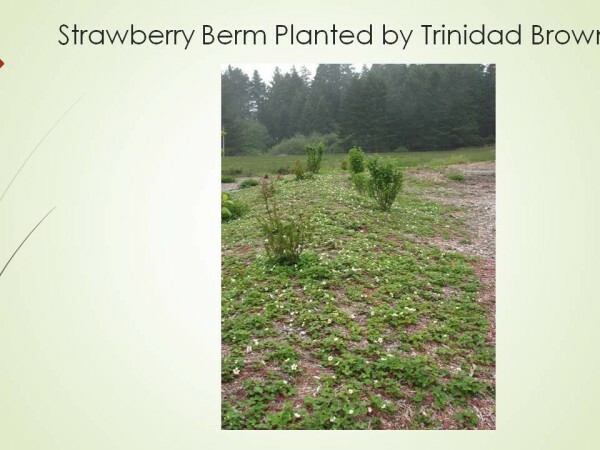 Thimbleberries are very common in more or less open sunny locations in forests and in full sun such as on the south side of Trinidad Head. It spreads by rhizomes, often forming large stands. Deciduous shrub. Twinberries have opposite elliptical leaves and pairs of yellow tubular flowers above spreading red bracts. The fruits are black berries sitting in pairs on the bracts (unpalatable to people). This plant is important to wildlife as both cover and a source of food. The red bracts attract Hummingbirds in spring, while fruit-eating birds take advantage of the berries. 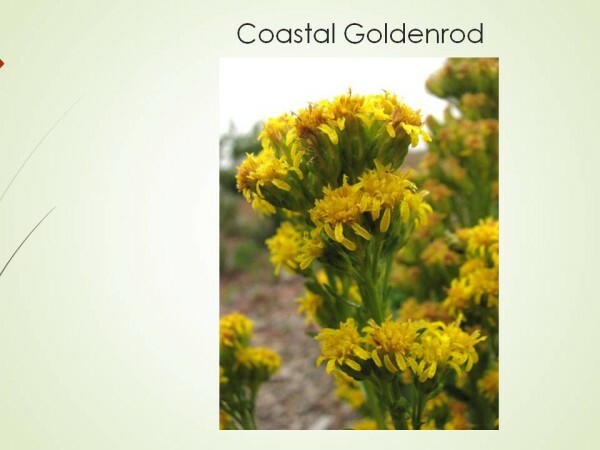 They occur in sunny areas and are part of the coastal shrub community on Trinidad Head. Evergreen. 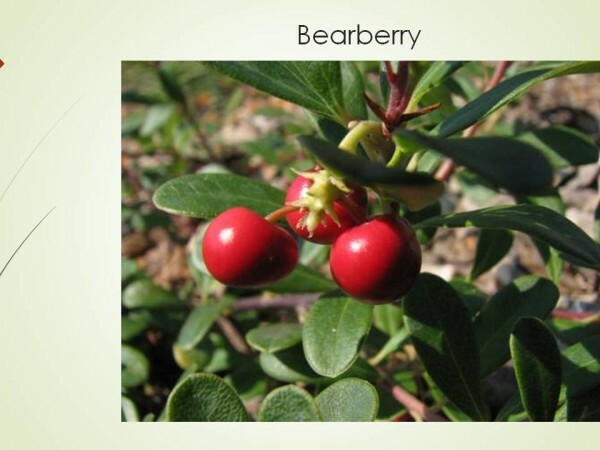 This relative of huckleberries is a prostrate shrub with small leathery dark green shiny oval leaves, small pinkish-white urn-shaped flowers in small terminal clusters, and round bright red berries which are eaten by wildlife (including bears), but are not palatable to people. The plants occur in open areas either partly sunny or in full sun. They are popular horticulturally as an attractive ground-cover in sunny locations. The flowers are attractive to bees. This splendid iris grows in large clumps from spreading rhizomes. It produces large spectacular flowers which vary in color from pale bluish through dark blue to deep purple-red. They all have yellow “landing pads” and dark nectar guides (dark lines) which attract pollinators to the nectar reward. Douglas irises are very common in our area in open sunny areas, such as Trinidad Head. We highly recommend this plant for home gardens. Deciduous shrub. This member of the rose family has long thin stems and more or less oval, lobed to coarsely toothed leaves. It produces dense sprays of numerous small white to cream flowers which turn brownish in late summer, and resemble splashes of sea foam. Ocean spray favors sunny dry areas and occurs on Trinidad Head. Horsetails belong to a very ancient group of plants which reproduce by spores. These plants have a central stem and whorls of thin stems radiating outward from the nodes. Their leaves are reduced and fused to form a papery brown sheath at the nodes. The spores are produced in a cone at the tip of the main stem. Horsetails are a plant of wet areas and form extensive stands from spreading rhizomes. They are an indicator of poorly drained soil. This is a perennial composite which dies back in winter. It forms large patches from rhizomes which produce a carpet of large, deeply divided, toothed leaves which are white-woolly on the underside. Clusters of composite heads with cream-white ray flowers and whitish to pinkish disk flowers appear before the leaves. The plants occur in moist open sunny areas and would be a good ground cover for sunny areas in gardens, but it spreads rapidly and can easily get out of control without special means to contain it. This is a large evergreen shrub in the sunflower family. Its leaves are small, wedge-shaped, and irregularly toothed. The flower heads occur in tight clusters and produce tufts of fluffy wind-dispersed seeds in late summer. It occurs in open sunny, areas and is a prominent member of the coastal shrub community, such as on Trinidad Head, and it provides good cover for birds. Salal is a spreading evergreen plant in the huckleberry family, with large, dark green, leathery leaves, urn-shaped white to pink flowers hanging in rows from red branches, and relatively large dark purplish-blue berries in late summer. The berries are an important food for wildlife and are edible by people (but not necessarily favored!). Salal is very abundant and can occur in full sun to moderate shade in open spruce forests, often forming impenetrable thickets. It can be used as an attractive hedge plant, but would have to be kept under control by pruning. This deciduous plant (related to thimbleberries) produces a thicket of upright woody prickly stems from rhizomes, has three-lobed leaves, and produces a few spectacular large rose-red flowers in early spring, which are attractive to bumblebees. Its salmon to red fruit is similar to a blackberry, and ripens in late summer. It is an important food for wildlife and is edible by people (but not favored by all). The plants usually live in damp shady places such as along streams, but can grow in full sun. (shrub) Deciduous. This beautiful shrub has leaves with rounded lobes and have a pungent odor. 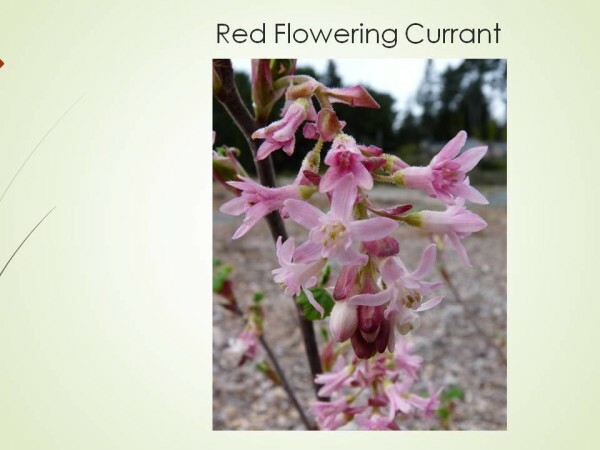 The clustered flowers range in color from deep red-pink to white, appear early in the spring, and are an important source of nectar for hummingbirds. The fruit is a round black berry and is a source of late summer food for birds (they are unpalatable to people). This is another component of the coastal shrub community and is common on Trinidad Head. It has become a popular garden plant locally (and was introduced to European horticulture by David Douglas in the early 1800’s). (small tree) Evergreen. The toothed leaves are long relative to their width, and the bark is smooth and gray. The flowers are small, occur in clusters, and produce small spherical nuts which are eaten by birds. Wax myrtles have root nodules which fix nitrogen. They are sun-loving and are common on old stabilized dunes, such as at Clam Beach, and on coastal headlands and bluffs. These dense, dark green trees are widely used in landscaping. Deciduous. This shrub has prickly stems with three large spines at the nodes, smallish leaves with 3-5 rounded lobes, small tubular flowers with white petals and deep purple-red sepals attractive to hummingbirds, and round prickly fruits. It occurs in forests and on coastal bluffs. (shrub) Deciduous. The large flowers occur in clusters and are white with variable amounts and shades of pink and yellow-orange, and are very fragrant. The plants are poor competitors and tend to get overgrown by other plants and so are not very common on the coast. A good place to see them is in the Azalea State Reserve, up Kane Road east of Big Lagoon. Azaleas are very popular ornamentals and there are many cultivars. The flowers are orange with dark spots, the petals are curved upward and inward toward each other. This lily occurs in dry, sunny, open places — Trinidad Head near the cross, Elk Head near the overlook of Flatiron Rock, and Patrick’s Point State Park in the field by Palmer’s Point. These are listed more or less in the order you encounter them as you walk the path clockwise from where the entry path joins the path around the pond. (small tree) Deciduous. The leaves are large, compound with lateral leaflets, and are opposite each other. The small cream-colored flowers are in clusters and develop into clusters of red fruits at the end of summer, which are much favored by fruit-eating birds such as band-tailed pigeons and robins. These trees are common in alder forests as a dominant understory plant and favor damp areas, but can occur in open areas. The berries are not edible by people unless they are cooked (they cause nausea when raw), and they are small and seedy. These small trees make an attractive addition to the home garden. This small plant in the iris family has long, narrow iris-like leaves and produces pretty yellow star-like flowers with six petals. It is a plant of wet sunny places, including ditches and we highly recommend it for wet areas in gardens. In the pond. Rushes often have flowers along the stem, or in a round tuft at the tip, while spike rushes bear their tiny flowers in a single thin, pointed spike at the tip of the stem. Rushes are very common in wet places and indicate poorly drained soil. This prostrate plant in the rose family has distinctive pinnate leaves with toothed leaflets which are silvery-white beneath from silky hairs, yellow flowers, and long red runners (like a strawberry), enabling it to form large patches in wet sunny areas and on dunes. A close location to see them is the area along the shore of Big Lagoon between the campground and the launch site. 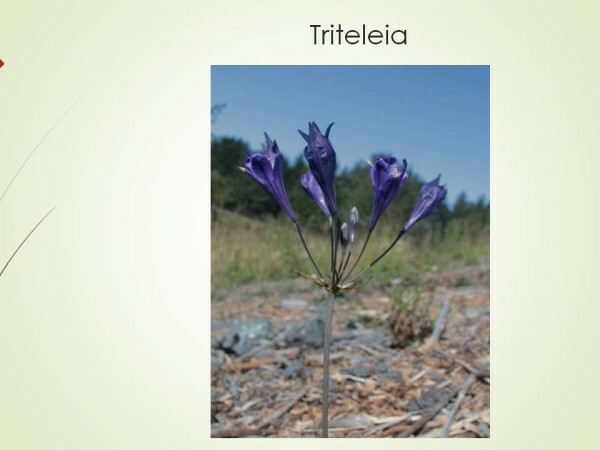 This member of the lily family and has grass-like leaves and a terminal spike of beautiful deep purple-blue flowers with six petals. 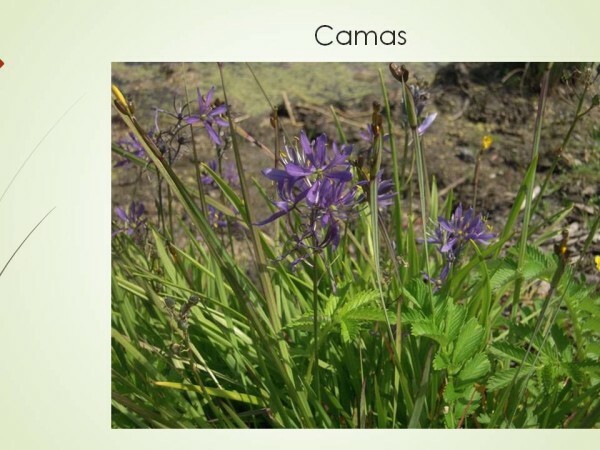 Camas does not occur in the Trinidad area, but is in the local mountains. 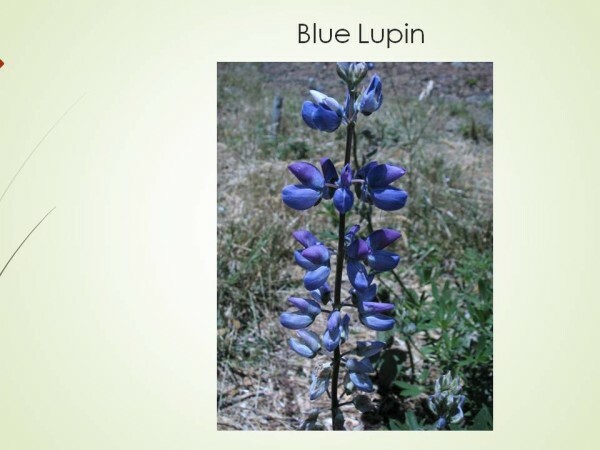 It is a plant of wet meadows and vernal ponds, and was extremely common and widespread in grasslands in the west before agriculture. Its bulbs were an important source of food for native Americans who lived where it grew (but they were very careful not to confuse it with the similar death camas, which has cream flowers). This plant (related to pitcher plants) also does not occur in the Trinidad area, but in fens and seeps in serpentine areas in the mountains of northwest California and southwest Oregon, and in the Sierra Nevada mountains in very scattered locations. Cobra plants are insectivorous and produce highly modified leaves, which trap insects. The insects die, fall to the bottom, and are decomposed by bacteria, thereby providing the plants with nitrogen and other nutrients, which are deficient in their habitat. The plant also produces very unusual flowers which are large, maroon and green, and born singly hanging from the end of long stems. Deciduous. This shrub or small tree in the rose family has oval, serrated leaves, white, bell-shaped flowers in inflorescences hanging from the axils of the branches, and small bluish-black fruits, which resemble small plums. The “plums” are edible by people, but are bitter and have a large pit, so are not choice. Male and female flowers are on separate plants. Osoberries occur in sunny areas on the coast and especially in inland areas at low elevations, such as around Fieldbrook and Blue Lake. They are not very common in the Trinidad area. shrub or small tree) This plant has many stems, which are used by the local Native Americans in making baskets. Its leaves taper to a point, are soft and fuzzy from long white hairs, and turn yellow in fall. The male flowers are in thin catkins, while the female flowers occur individually. The female flowers are small and inconspicuous, but have striking, bright red stigmas. Individual trees have both kinds of flowers. The fruits are spherical nuts resembling small filberts enclosed in a prickly green husk which tapers into a beak-like projection. They were eaten by the local natives, and are a favorite food of squirrels. Hazels occur in open areas in forests in moist places, but are relatively rare on the coast. (shrub or small tree) Its leaves are toothed, have irregularly lobed margins, and turn orange to red in the fall. The flowers are white to pinkish and occur in clusters. The apples are yellowish to reddish and edible but sour. The apples are another source of food for wildlife and the plants provide good cover for them. The trees grow in moist woodlands and more open coastal areas. There are some on Trinidad Head intermixed with other shrubs along the paved road. Crab apples would make an attractive addition to the home garden. 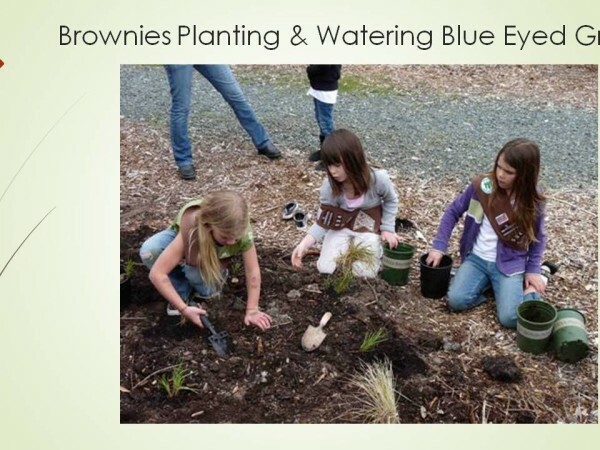 These plants were planted as representative of coastal prairies. Grasses are the foundation of this habitat. 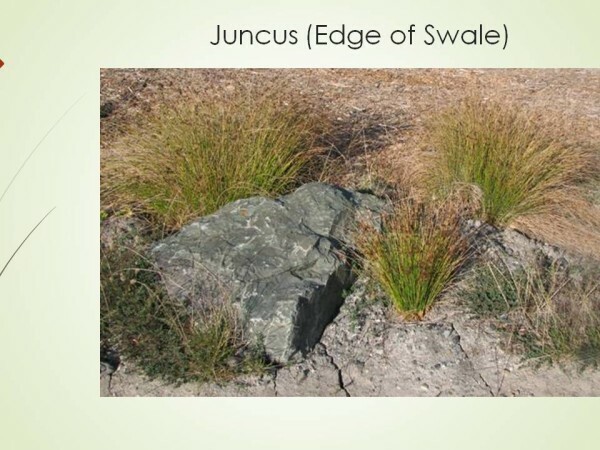 Native grasses grow in clumps and do not form mat-like lawns. They afford protection for many beautiful sun-loving flowering plants on our wind-swept coast. 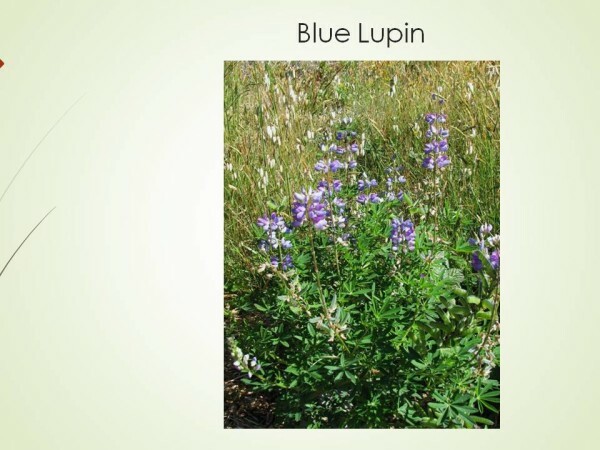 The plants are listed in no particular order, since they occur throughout the meadow. Many of these plants have been described earlier in the list. This grass forms large, tough clumps, and is our largest, densest native grass. It can be confused with the non-native Pampas grass, but it is much smaller, the edges of the leaves do not have sharp teeth which can draw blood, and it does not produce plume-like inflorescences. This is the dominant native grass of the coast, as it can withstand wind and salt spray. A good place to see it is on Elk Head near the bluff. This grass forms dense, fine-leaved clumps with graceful, open, glistening, bronze, nodding inflorescences. It is also very tolerant of salty air. Fireweeds have long stems with long, narrow, alternate leaves. The showy flowers are bright pink and have four petals. Late in summer the plants produce long narrow pods, which split to release tiny fluffy seeds which are carried far and wide by the wind. Fireweed is a plant of disturbed sites and occurs around the world. This perennial has rhizomes and can form large spectacular stands in summer, but dies back after releasing seeds. Fireweed is very common on Trinidad Head along the road, where it makes a spectacular show. This composite has crowded narrow leaves, and produces bright gold flowers in late summer. Like fireweed, the seeds have a tuft of hairs and are distributed by the wind. Goldenrods spread by rhizomes to form patches in open, sunny, often disturbed places. 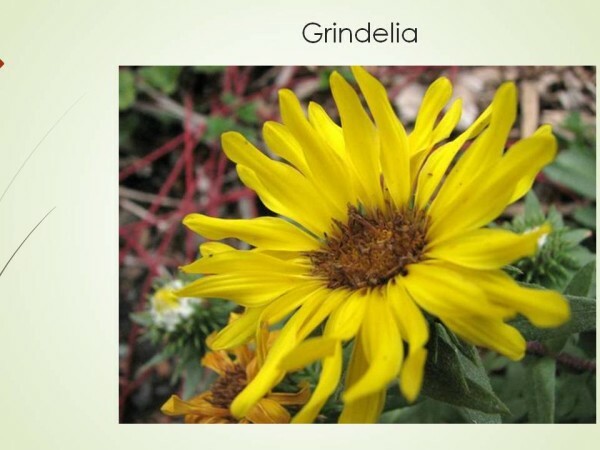 Its Latin name means to make whole (to cure), and it has many medicinal uses. During the American Revolution its leaves were a common substitute for heavily taxed tea. This composite spreads by rhizomes and can form large patches. It has violet-blue ray flowers surrounding a yellow center of disk flowers, which attract butterflies. It is widely distributed and abundant in meadows and other sunny open areas. It makes a good garden plant — colorful, a late summer bloomer, valuable for pollinators, and easy to grow, but its rhizomes can get out of hand. This member of the iris family has narrow grass-like leaves. The flowers are a deep purple-blue with a yellow center, and have six petals. The plants seed readily and can be very abundant among the grasses. Blue-eyed grass is a wonderful addition to gardens. 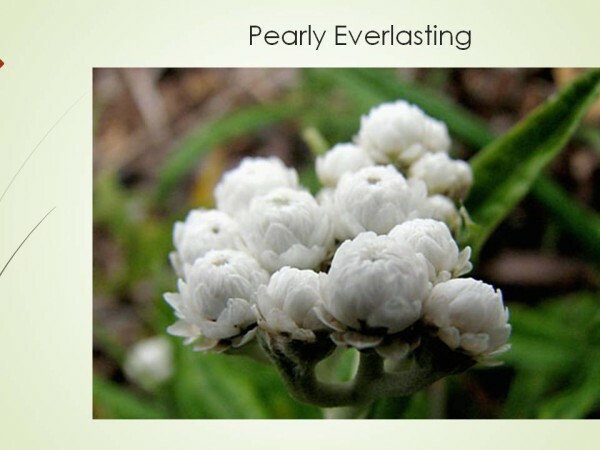 Pearly everlasting is a common perennial composite of grassy areas, which spreads by rhizomes. It has long, narrow leaves which are white-woolly underneath. The small flower heads, composed only of disk flowers, have dry, pearly-white bracts ringing them. The flowers are produced in late summer into winter. The bracts keep their shape and color when picked, making everlasting, attractive dried bouquets. This perennial member of the mint family spreads by creeping rhizomes to form large mats of ground-hugging leaves and two-lipped purplish flowers clustered on a short erect stem. 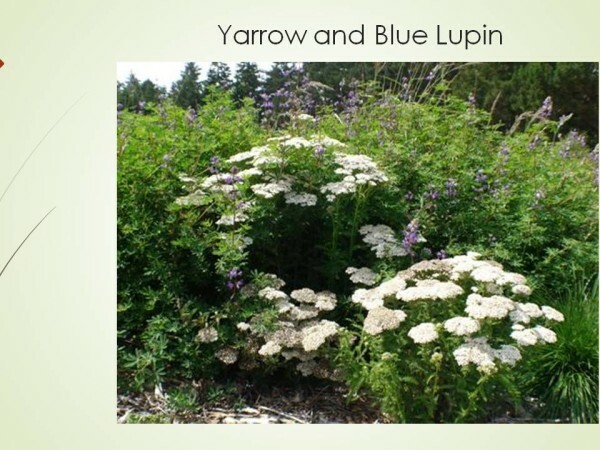 It occurs world-wide and has been traditionally used to heal all sorts of things, and consequently has been planted in gardens for a long time. This beautiful member of the lily family has narrow leaves and open umbels of purple-blue trumpet-shaped flowers with six petals. The plants occur in warm, sunny grassy areas where there is little competition from larger plants. Therefore, they are not common in our area. The bulbs were eaten by many native peoples. The plants are often planted in gardens. The orange monkeyflower is a small bush with tough, woody stems. The leaves are narrow with rolled-under edges and are often sticky on the upper surface. The flowers are large and orange. Orange monkeyflowers generally grow in warm, dry, rocky areas, and are fairly common on Trinidad Head. We highly recommend these plants for gardens. They are beautiful, easy to grow, and require relatively little care compared with most exotics. Native plants are continually being destroyed by development and logging, causing plants (and wildlife) to lose more and more habitat and become ever scarcer. Growing natives is one way to “pay back” the environmental cost of your house. Many exotic horticultural plants have escaped and become destructive invaders, out-competing and replacing natives. The worst ones locally include Cotoneaster, holly, pampas grass, and by far the worst of all: English ivy. Ivy is particularly destructive, because it can’t be shaded out by trees, as the others can, but produces thick mats over all types of plants, from forest floor plants, to shrubs, and even trees. 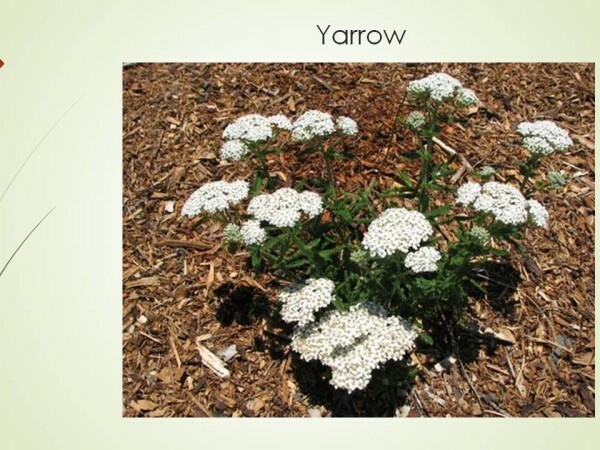 You can help by not growing these plants and by getting rid of them if they are already in your yard. 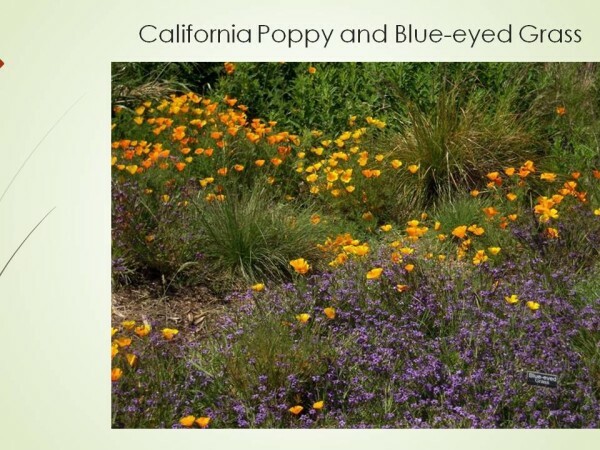 An excellent source of native plants is the California Native Society (CNPS), which has two plant sales per year, in September and during the Wildflower Show in early May. You may purchase plants at other times through Chris Beresford at thegang7@pacbell.net, or call 826-0259. The CNPS website is www.northcoastcnps.org.